Distribution: Throughout eastern North America. Description: A conspicuous and common plant in summy open areas. Wild Carrot, also called Queen Anne's Lace, has flat-topped, white, circular flower clusters (umbels) often, but not always, with a single tiny purple flower in the center. The individual flowers themselves are tine and the clusters are usually around 3-4 inches in diameter in mature plants. They have narrow, 3-forked bracts below. The clusters eventually close-up into a cup shape and resemble bird nests with many tiny bristle-hair covered seeds. The leaves are finely dissected, similar to Parsley (not surprisingly) and not as delicate as Yarrow. The stems are always hairy but may have few to many hairs. The stalk especially smells like carrot when crushed or scratched. As this plant has a few very poisonous look-alikes, care must be taken to positvely identify this plant before any contact. The stems must have a few to many small fine hairs. The stems and foliage must have a carrot smell, as should the root, which looks like a small, white carrot. This plant may have a good deal of natural variation. This plant is a biennial. In the first year it consists only of a bunch of basal leaves which produce and store energy in the taproot. The leaves die back in the fall and the energy in the root is used the following spring to grow a tall flowerstalk. Edibility: As this plant closely resembles a few extremely toxic plants, make sure you have identified this plant with certainty before any contact. Carrot leaves can be eaten raw, though with some moderation. The first year roots can be prepared and eaten like cultivated carrots. After the first year the plant has used all of the energy stored in the root to produce the large flowerstalk, leaving the root fairly woody and inedible. This woody root can still be added to soups and stews to provide a carrot like flavor. Carrot seeds have a very strong taste and can be used as a seasoning. The are often available on the plant into the winter. Habitat: Open sunny areas. Fields, Roadsides. Poisonous: Although this plant is not poisonous, it closely resembles many other plants in the Parsley family, some of which are highly poisonous. The leaves look quite similar to Poison hemlock, especially when young or during its first year. Be absolutely sure you have indentified this plant correctly before using. Its poisonous look alikes all have smooth stems, whereas Wild Carrot's stems are hairy. Poison Hemlock's stems may be spotted with purple. The poisonous relatives also have foul smelling foliage when crushed. Utilitarian Uses: The dried seed heads can be used as the core of a tinder bundle due to the many fine hairs on each seed. Other Notes: All of our modern carrots are ultimatly descended from this plant. 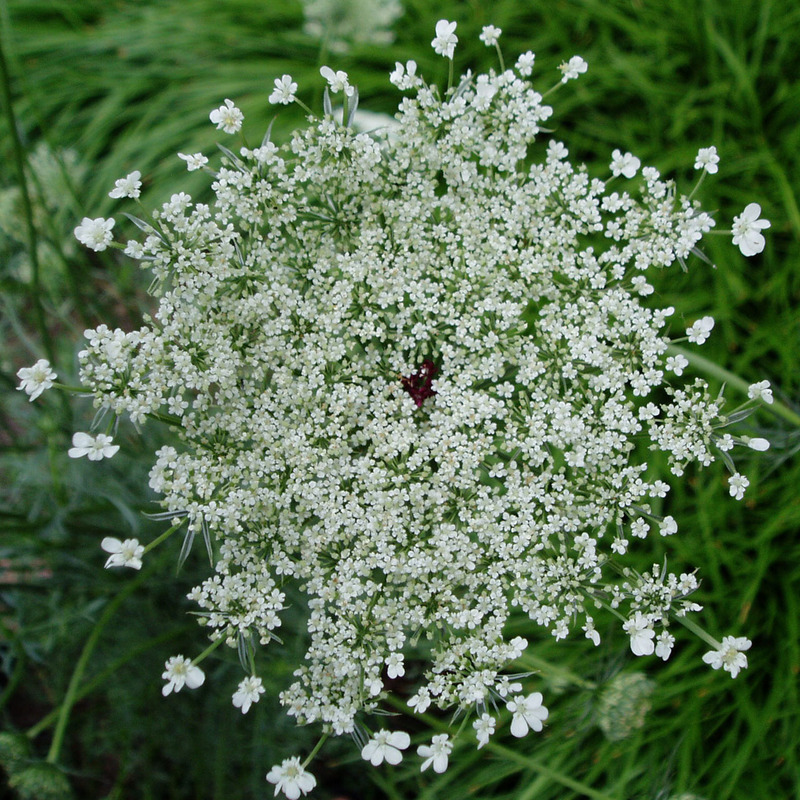 The comon name, Queen Anne's Lace, refers to the historical Queen Anne, beheaded wife of King Henry VIII of England. The white flower cluster representing the lace around her neck and the tiny purple flower in the center representing the point of decapitation.